282 Berkeley (29 Commonwealth) is located on the NW corner of Commonwealth and Berkeley, with First Church Boston to the north, across Alley 423, 50 Commonwealth (260 Berkeley) to the south, across Commonwealth, 25-27 Commonwealth to the east, across Berkeley, and 31-33 Commonwealth to the west. 282 Berkeley (29 Commonwealth) was designed by architect J. Pickering Putnam and built in 1894-1895 for real estate developer William Henry Harrison Newman as a 26 unit apartment house, called Haddon Hall. William H. H. Newman was a real estate dealer and developer. 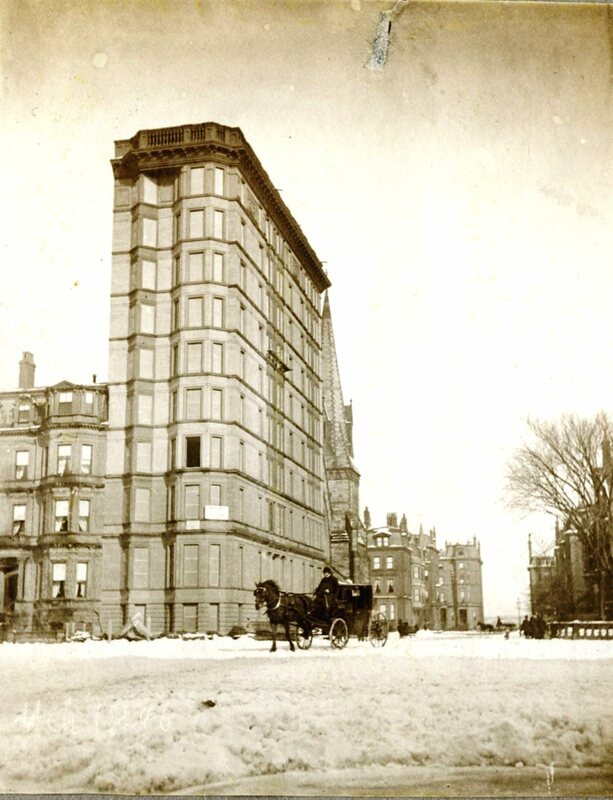 He owned the Hotel Cluny at 543 Boylston, also designed by J. Pickering Putnam, where he and his wife, Sarah E. (Cole) Newman, lived. 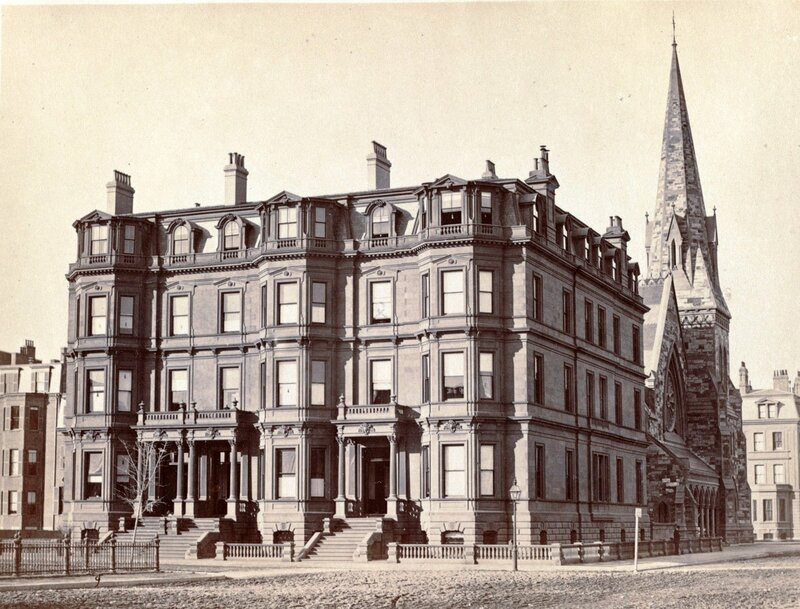 He purchased the original townhouse at 29 Commonwealth on May 19, 1893, demolished it, and filed the original permit application for Haddon Hall on July 16, 1894. Click here for an index to the deeds for 282 Berkeley (29 Commonwealth). “W. H. H. Newman is to erect a handsome new apartment hotel at 29 Commonwealth av. corner Berkeley st. The building will be nine stories high and will contain all the modern conveniences. The lot, which is the old Bowditch place, was purchased at auction by Mr. Newman for $83,000. Plans and architectural specifications for the building — including elevations, floor plans, piling and foundation plans, and beam and steel framing plans — are included in the City of Boston Blueprints Collection in the Boston Public Library’s Arts Department (reference BIN A-88). At 125 feet, Haddon Hall was significantly higher than its neighboring houses. 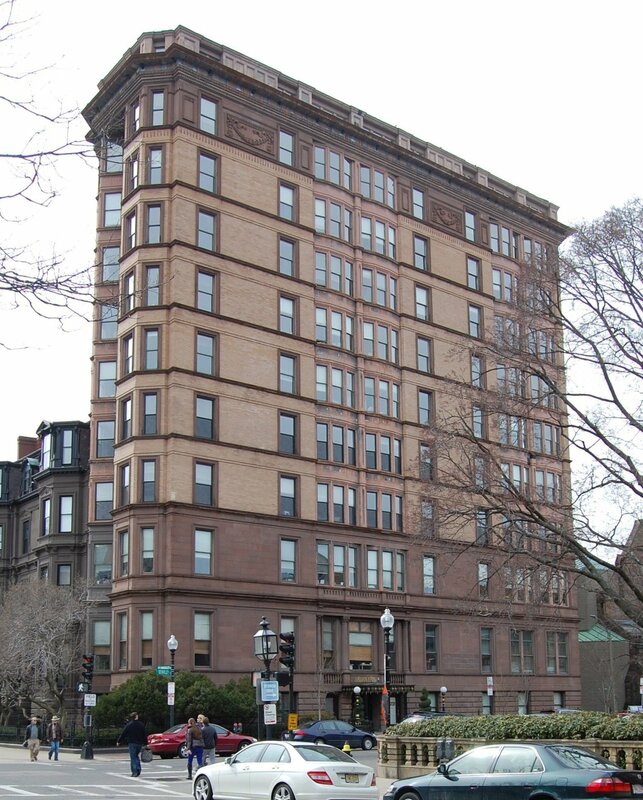 The Back Bay’s deed restrictions, written before elevators, imposed a minimum height of three stories but no maximum height. A community movement, organized under the auspices of the Twentieth Century Club, sought legislation limiting the permissible height. As a result, in 1896 a limit of 70 feet was imposed on Commonwealth Avenue (this limit was later reduced further to 65 feet). 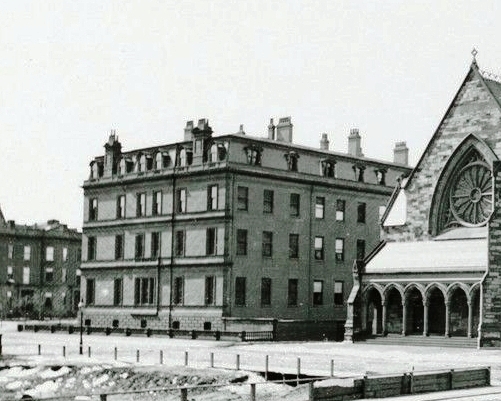 Michael Holleran’s Boston’s Changeful Times: Origins of Preservation & Planning in America (The Johns Hopkins University Press; 1998) discusses this community effort in detail. On October 24, 1900, Haddon Hall was purchased from William H. H. Newman by Henry Staples Potter, Jr., and one month later, on November 20, 1900, it was acquired from him by William F. Wharton and Edward Bangs, trustees of the Apartment House Trust. 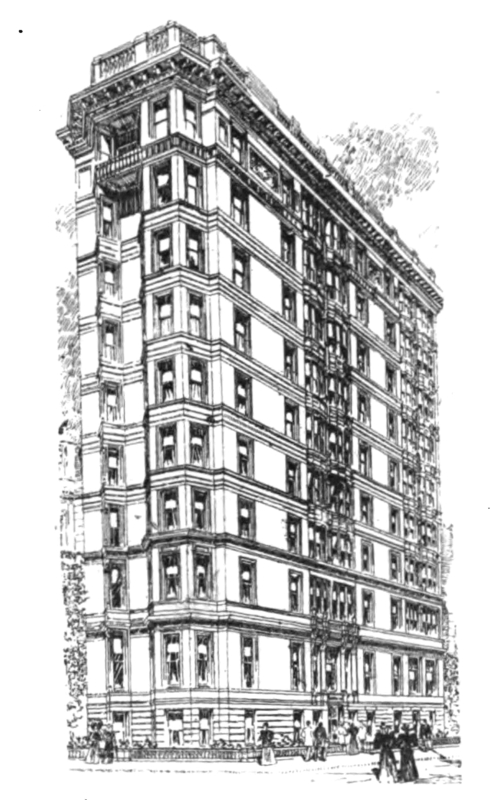 On December 5, 1900, the trust was reorganized as the Metropolitan Associates. On August 31, 1925, 282 Berkeley (29 Commonwealth was acquired from the Metropolitan Associates by real estate dealer Elliott Henderson and investment broker Harcourt Amory, Jr., trustees of the Berkeley Street Trust. In about 1928, Haddon Hall was converted from apartments into medical (primarily dental) offices. The last residents were listed there in the 1928 Blue Book. The Building Department records do not include the permit application for this change in use and, presumably, accompanying remodeling. As originally built, 282 Berkeley (29 Commonwealth) was a ten story building, surmounted with a high balustrade. By the late 1920s, an additional story had been constructed in place of the balustrade. Once again, the Building Department records omit any documents on this change. It is possible that the addition occurred much earlier, possibly not long after the building was built, inasmuch as the Bromley and Sanborn maps for the period between 1898 and 1938 show no change in the number of stories. On December 10, 1934, Conveyancers Title Insurance and Mortgage Company foreclosed on its mortgage to the Berkeley Street Trust and transferred the building to its affiliate, Realty, Inc. Both companies subsequently went into receivership, and on October 16, 1942, George Alpert, the court-appointed receiver for Realty. Inc., transferred 282 Berkeley (29 Commonwealth) to the Conveyancers Realty Company. 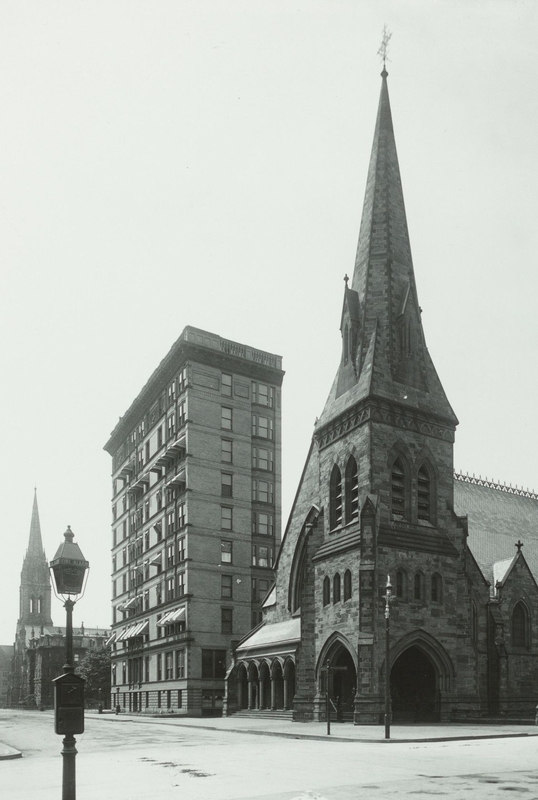 282 Berkeley (29 Commonwealth) and First Church Boston (ca.1900); courtesy of Historic New England. Simon Friedman died in June of 1956 and Celia (Gorin) Leeder died in November of 1957. Adelaide (Ober) Friedman subsequently married Frank Leeder. On March 9, 1962, she transferred her half interest in 282 Berkeley (29 Commonwealth) to Frank Leeder and Harry Gorin. On July 31, 1962, Frank Leeder and Harry Gorin transferred the property to themselves as trustees of the Haddon Hall Trust. On February 24, 1965, 282 Berkeley (29 Commonwealth) was purchased from Frank Leeder and Harry Gorin by Howard N. Levin, trustee of The Kensington Trust. He continued to operate it as an office building. 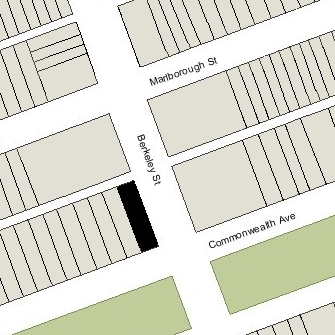 On December 30, 1986, 282 Berkeley (29 Commonwealth) was purchased from Howard Levin by Richard D. Cohen and Phil David Fine, trustees of the RDC-Commonwealth Avenue Realty Trust. On August 13, 1993, Richard D. Cohen and Jeffrey J. Cohen, trustees of the RDC – Commonwealth Avenue Realty Trust, transferred Haddon Hall to the 29 Commonwealth Limited Partnership (RDC Development Corporation, general partner). Since 1928, Haddon Hall evolved from medical offices into a wider range of professional offices. It remained an office building in 2017. On January 4, 2017, 282 Berkeley (29 Commonwealth) was acquired from the 29 Commonwealth Limited Partnership by 29 Hexagon LLC (Sandra Edgerley, manager of record). In August of 2017, 29 Hexagon LLC announced plans to convert 282 Berkeley from offices into an 800 member private club with dining, lodging rooms, and other amenities. The proposal met with significant opposition from neighboring residents, concerned about the impact on traffic, safety, and noise. In January of 2018, 29 Hexagon withdrew the proposal and announced plans to return the building to residential use. That same month, Hexagon Properties entered into a preliminary agreement to acquire the Algonquin Club at 217 Commonwealth, renovate the building, and continue its operation as a private club. The townhouse which Haddon Hall replaced was built in 1863-1864, one of three contiguous houses (29-31-33 Commonwealth) built at the same time, and one of ten contiguous houses (29-31-33-35-37-39-41-43-45-47 Commonwealth) built in the same design between 1863 and 1873. Bainbridge Bunting’s Houses of Boston’s Back Bay indicates that 29 Commonwealth was built ca. 1864 and does not attribute it to a specific architect. However, a May 15, 1863, article in the Boston Transcript indicates that 29-31-33 Commonwealth were designed by Gridley J. F. Bryant and Arthur D. Gilman. 29 Commonwealth was built as the home of Joshua Stetson and his wife Ellen (Lamb) Treadwell Stetson. They previously had lived in Brookline. He purchased the land for 29 Commonwealth on June 3, 1863, from the Commonwealth of Massachusetts. Click here for an index to the deeds for the original townhouse at 29 Commonwealth. Joshua Stetson was a textile merchant and treasurer of the Washington Mills in Lawrence and the Burlington Mills in Burlington, Vermont. On July 16, 1869, 29 Commonwealth was purchased from Joshua Stetson by Elizabeth Brown (Francis) Bowditch, the widow of attorney Nathaniel Ingersoll Bowditch. Joshua Stetson died later that month, and Ellen Stetson moved to 145 Beacon. Elizabeth Bowditch made 29 Commonwealth her home. She previously had lived at 9 Pemberton Square. She also maintained a home in Brookline. Elizabeth Bowditch died in January of 1892, and on May 19, 1893, 29 Commonwealth was purchased from her estate by William H. H. Newman. He subsequently razed the house and built Haddon Hall in its place.